This half-day workshop will provide participants with the necessary knowledge and resources to detect commercial vehicle safety-related defects and violations prior to operation. The 2019 Commercial Vehicle Safety Alliance (CVSA) Out-of-Service (OOS) Criteria Handbook is used by enforcement officers across North America to determine when a commercial vehicle should be taken out of service. The 2019 OOS Criteria came into effect throughout North America on April 1, 2019. The handbook is a "must have" resource for truck and bus safety managers, fleet directors, drivers and shop professionals, and this workshop provides an opportunity to learn the criteria directly from Commercial Vehicle Safety and Enforcement (CVSE). This half-day workshop, conducted by a CVSE enforcement officer, will provide participants with the knowledge and resources to detect commercial vehicle safety issues and violations before their vehicles become operational. In turn, this will reduce expensive shipping delays, repair and towing costs, and negative safety reports for the company. Topics to be discussed include changes in OOS Criteria from 2018 to 2019, common roadside violations (with pictorials), and a walk-through of the Level 1 procedure which defines how components are checked in relation to criteria. 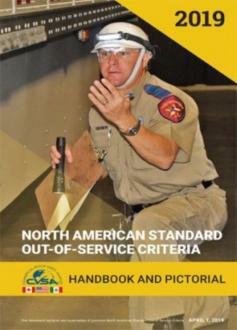 Each participant will be provided with a current copy of the North American Standard Out-of-Service Criteria Handbook and Pictorial as well as have the opportunity to ask questions at the end of the workshop. o Who and what is it?